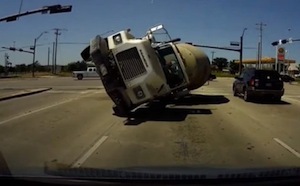 Los Angeles County Truck Accident Injury Lawyers - 40 Years of Litigation Expertise! Personal Injury Truck Accident Lawyers in Los Angeles County Whom You Can Trust & Count on! Fatalities & Injuries From Motor Vehicle Accidents In Los Angeles County, Calif. There were 7,249 truck collision injuries in 2011 in California, of which 2,212 of the people injured were in Los Angeles County. There were 2,257 truck drivers at fault for California truck collisions in 2011 and the truck drivers between the ages of 45-49 years were the most common in being at fault for the accidents with 320 faults recorded. Our Los Angeles truck accident injury lawyers and law firm provide aggressive legal services for those injured in truck, motorcycle, automobile, bicycle, and any other type of accidents, and to the relatives and families of those killed in fatal truck or car crashes for wrongful death claims, in Los Angeles County, California. Simply call us or contact us now for your absolutely FREE case evaluation & consultation with an experienced truck accident injury attorney or any member of our truck & car accident legal team. If you have a good case we shall be glad to represent you on a contingency fee basis – which means we do not get paid unless and until we WIN. And if we think otherwise, we shall be direct and honest with you and tell you. So there is NO reason to wait. Please call us or contact us now. With California truck accident cases, different issues may arise so prompt investigation is advised. One potential issue pertains to the route the truck driver was following and how much time the driver was given to complete the route and how many rest stops were allotted and for how long. Majority of truck collisions occur due to tired & fatigued truck drivers who, for a little bit of extra pay or other reasons, attempt to cover too much ground in a day. Sometimes this results in the truck driver falling asleep while driving and losing control of the truck. This neglectful behavior has proven catastrophic for the small cars and other vehicle passengers, especially their passengers, struck by much larger and heavier trucks. Trucks moving at a high speed with their heavy cargos can result in a devastating crash or accident with brutal injuries or even fatalities to those in cars and the drivers of bicycles, motorcycles and other smaller vehicles. If you or a loved one have met with a tragic truck accident in Los Angeles County or any other place in California, contact experienced and aggressive truck accident personal injury attorneys at the Walch Law Corp. Please visit our Truck Injury Accident Web Site to learn more about the truck accident injury claims process, our attorneys and law firm. Los Angeles County, also known as L.A. County, is the most populous county in the United States. According to the 2010 U.S. Census, L.A. County had a population of 9,818,605. Los Angeles County is included in the Los Angeles-Long Beach-Anaheim, CA Metropolitan Statistical Area, which is the second-largest metropolitan area in the United States. The county is home to many cities, including Los Angeles, Beverly Hills, Calabasas, Santa Monica and West Hollywood, the famous community of Hollywood, the Los Angeles Dodgers, the Los Angeles Lakers who play at Staples Center, UCLA, USC, and over a quarter of all California residents and is one of the most ethnically diverse counties in the country. A truck accident is a serious matter that can lead to tragic outcomes and have long-lasting effects on the victims involved. Thus, it is very important to solicit help from experienced and compassionate truck accident personal injury lawyers. We have over 40 years of experience in successfully resolving countless truck accident cases, car accident injury claims, wrongful death claims, and other personal injury claims in Los Angeles and all of California. You can get more information about our Los Angeles personal injury & wrongful death truck accident attorneys and law offices by reading our lawyer profiles, and our personal injury & wrongful death case testimonial pages. Immediate help with medical care, medical specialists, property damage repair and settlement, loan cars, monetary advances, medications, prescriptions, etc. So, if you’re injured in a truck collision or need assistance in your personal injury claim, please get in touch with our truck accident injury lawyers and our legal team now for a completely FREE CONSULTATION and CASE EVALUATION. Our consultation is absolutely FREE and we work on a contingency basis, so there’s NO fee until you WIN! Please contact us now…You will be very glad that you did!